Electro-acoustic Fanfare for computer tape (1983). 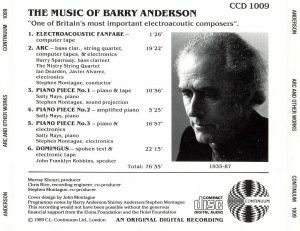 As I’ve written in my review of Continuum’s companion CD, Mask, Barry Anderson, born in 1935 in New Zealand, is the guy who created, at IRCAM, Boulez’ electronic studio in Paris, all the electronics for Harrison Birtwistle’s The Mask of Orpheus, didn’t get recognition – and first from the composer himself – for his work and for what he saw as his co-authorship, and then, when his recognition as a composer was about to happen (IRCAM having commissioned a piece), died, a few hours after the premiere of that piece, Arc, on 27th May 1987, for causes that may include exhaustion from the work done for Birtwistle. What’s left of him is not even an entry on Wikipedia, just this and the companion CD, published by Continuum in 1989 and a fine tribute masterminded by composer Stephen Montague (who was an associate of Anderson from 1975 to his death, and is a fine composer in his own right). The other CD features principally a long piece, Mask, running 40 minutes, for flute, percussion and tape, in which I found the tape part to be not so imaginative. This one is probably a better introduction to the music of Anderson. You know a piece is great when you are sorry that it’s so short. So Electroacoustic Fanfare is a great piece, because in the course of its 1:30 it overflows with invention in electronic sounds. 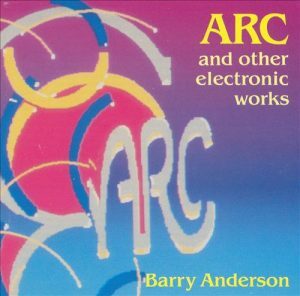 Arc for bass clarinet, string quartet, computer tapes & electronics is not just Anderson’s valedictory piece, it’s also a fine composition, because the electronics are inventive and because of the ability of clarinet and string quartet to really dialogue in sound and out-of-the-customary modes of sound production with electronics and tapes. And the same is true with the three piano pieces. The music is jagged and angular but imaginative and atmospheric, this is not about neo-romantic, neo-tonal “melody” but about sonic clashes, between a percussive piano that seems to come out of a Conlon Nancarrow player piano turned disfunctional, and spurts and gargles of electronic sounds, very much R2D2 on cocaine. In the third piece, you can’t even distinguish which instrument is playing, the piano or the synthesizer keyboard. At 22 minutes, Domingus is the longest piece on the CD and a commission from the BBC Radio 3 from 1978, of a setting of Paul Hyland’s eponymous poem. The commission came with strictures: Anderson was not to distort the voice electronically, but rather wrap it “in a kind of sonic landscape underlining and heightening the poetry of the text”. That’s what he does, which means that his electronic composition is atmospheric in a generic way but not always extraordinarily inventive, a lot being the kind of “space” resonance similar to what it was in Mask and that seems to be a cliché of electronic music, with a few more unexpected and intriguing spurts of sounds here and there, but because the unfolding of the music closely follows that of the text and speaker, they sound like an arbitrary rambling assemblage rather than to derive from a strong, self-sufficient dramatic logic. In that respect, it can be said that Anderson fulfilled his commission to the hilt: the electronics never come in the way of the text. It’s not true the other way around, and as a documentation of Anderson’s achievements, it’s a bit frustrating. Text of poem not provided, TT a generous 79 minutes, informative liner notes and a fine memento of a composer who didn’t get his breakthrough.